Never miss a thing with the Swann 8 Channel 4K Ultra HD 2TB DVR security system, which features weatherproof cameras, night vision, push notifications and compatibility with Google Assistant for voice control. The Swann 8 Channel 4K Ultra HD 2TB DVR features 4 bullet cameras that come equipped with a True Detect PIR sensor, designed to trigger auto recording and push notifications when heat is sensed. This means that your system will only record the relevant events such as people and cars. Upon sensing movement, you will receive push notifications that allow you to act immediately. Use voice commands via Google Assistant and Chromecast to stream video from your security cameras to your Smart TV. You can customise commands so that you can monitor your home, hands-free. Your security just got smarter. 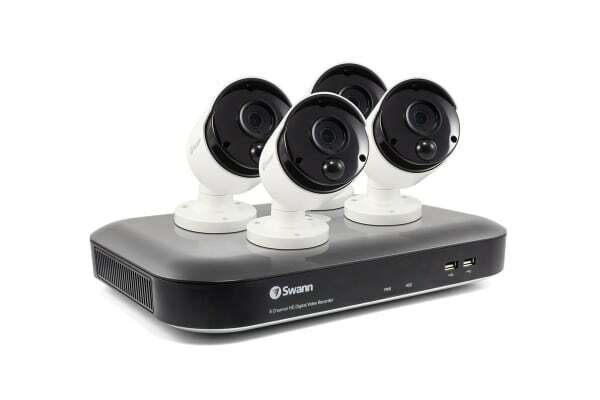 The Swann 8 Channel 4K Ultra HD 2TB DVR comes equipped with 4 weatherproof bullet cameras, designed to withstand the rain, snow, sunshine and dust. Rest assured knowing that the cameras have a IP66 weatherproof rating, and are built to protect your home day in, day out, rain or shine.